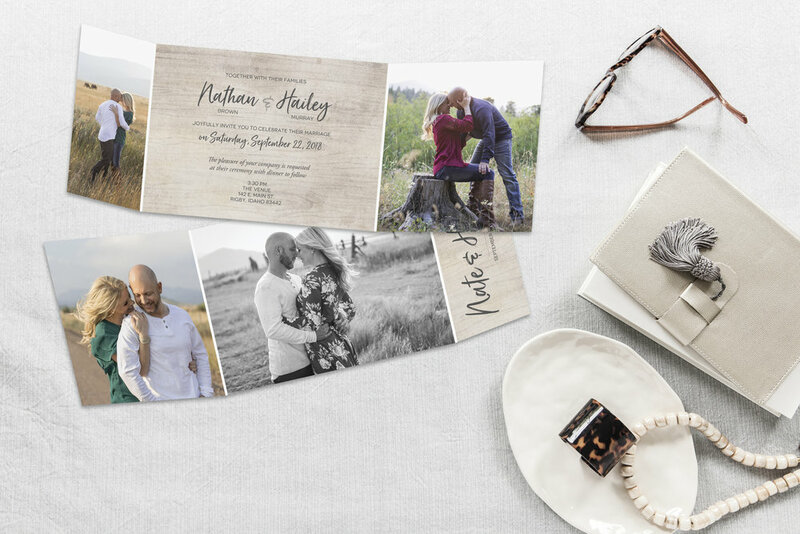 Anthology Custom Print has been designing and printing high quality, unique wedding invitation suites since 2008, at prices that won't break the bank! Our designer Bryan is experienced and has already helped over 1,000 couples to design their perfect wedding invitation. Each design you see is completely customizable. Check out some of our real couples’ designs below! 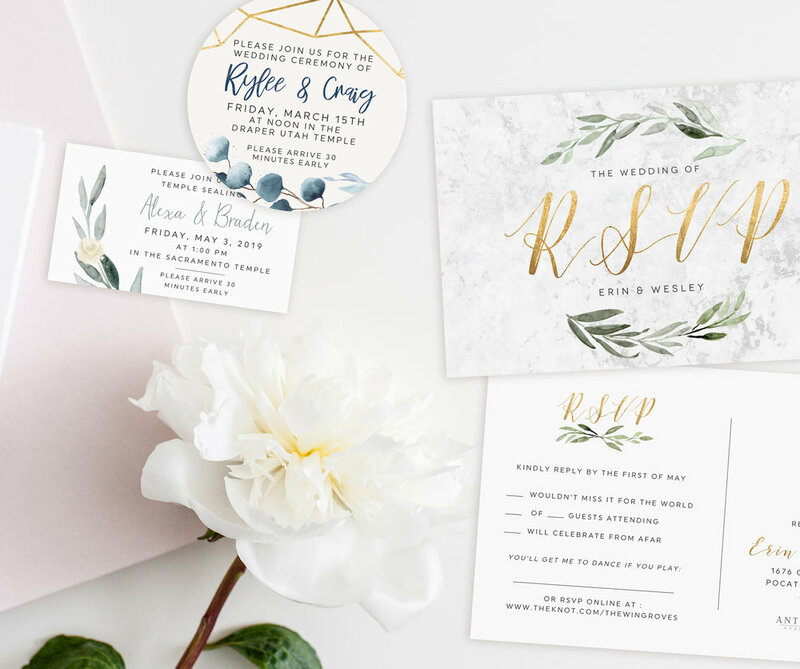 VELLUM INVITATIONS - COMING SOON! Come into our studio in Rexburg Idaho to see samples, design one-on-one, and leave with an email proof! Click the link below to set up a time. 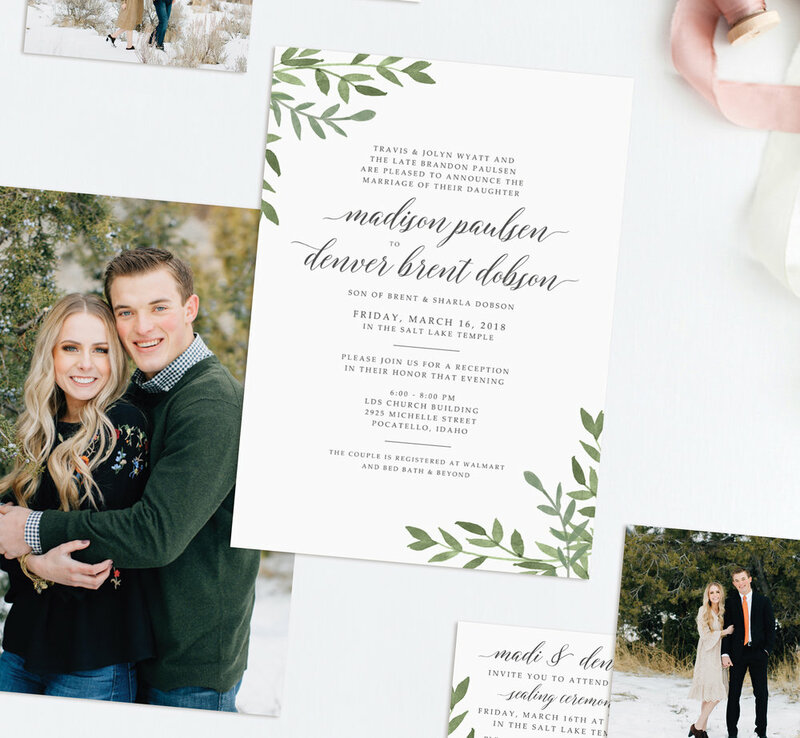 Hang out in the comfort of your home and still get amazing wedding invites! Click the link below to submit your info and get started! Check out our Getting Started link to get a more in-depth overview of our process.You can even request a sample pack! Hi! We’re Kim & Bryan- the force behind Anthology Print! Kim runs all the social media & website tech (head over to Instagram or Facebook and say hi!) and Bryan is the genius designer who works one-on-one with you to design your perfect wedding suite from start to finish! We are excited to meet you and look forward to working with you! "Bryan was great to work with. He really works to create items that are made of styles you love but unique to you. He had good advice on how to handle envelopes, timing and how to get the best bang for your buck. Very pleased! Way better than Zazzle or Shutterfly cost. " "Bryan was more then amazing. I had an idea of what I wanted but he created it better then I could have even imagined. He has worked with me from the time we had my appointment till even after with my editing and craziness. I would suggest anyone to work with him because they WONT be disappointed. " "I already had my design and just needed adjust a few things for printing. Straight to the point and so helpful. " Top service, quality, and experience are a part of Anthology! "I was very pleased with Anthology. It took the worry away for announcements and prints with how easy the process was, the good service, and it was exactly what YOU want (no questioning, no surprises)! " "Bryan was SO great to work with! I had an idea of what I wanted, and he did exactly that and even more! I was so happy with how everything turned out, and we got so many compliments on our announcements. I'm so glad we came here!" "This guy is a wizard on the computer! He had the entire invitation done in 30 minutes, and it looked amazing!! He was super helpful, and seriously, he did it so quickly! I would 100% recommend this place to anyone looking for invitations of any sort! LOVE LOVE LOVE the way they turned out!! " "Bryan was excellent to work with and had us gleaming over our invites by time we left. He is prompt and a professional at what he does. He is also priced very fairly and does great professional work for a great cost. " "They were perfect. This man really knows his stuff and what he's talking about to make them perfect!! :) I love love love them. But they haven't printed yet, so they could be even more perfect!" "Bryan is especially talented and patient. We went to another print shop originally and were not happy with the design. Bryan completed turned it around and we loved it! He is funny too!" "I had such a great experience working with Bryan! He is so talented and committed to helping you find something you love. I would definitely refer anyone to him! I’m so happy with how my announcements turned out! " "Bryan was so knowledgable when it came to his photoshop program, he made exactly what I wanted before I knew I wanted it. I could ask for anything, and he would know how to make it happen. He was very kind, great to work with, and very patient. Definitely recommend. " "Quick and easy process! The price is very affordable and the invitations are great quality. Overall, very happy with the service!" "Best customer service. Cheap easy and best quality around. Really happy I found them!! Couldn’t be happier with how are wedding invites turned out! " 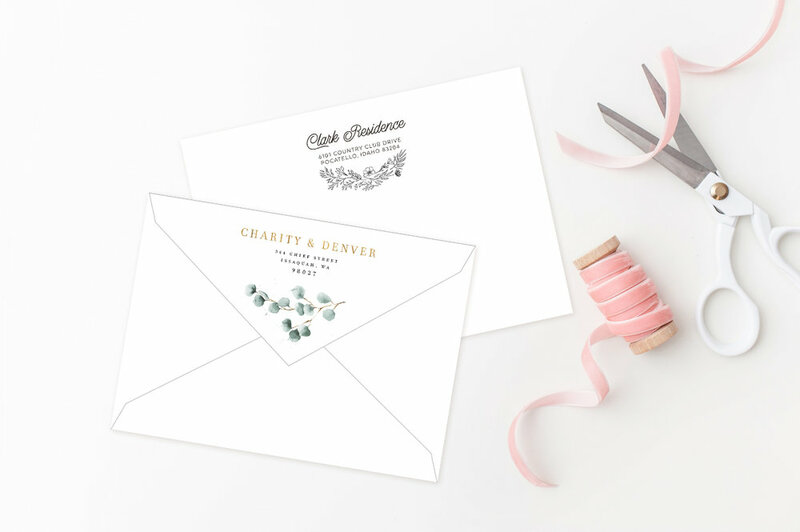 Bomb Wedding Invitations and more! "They were super helpful and friendly! Provided beyond our expectations. We are super happy and excited!" "I was very stressed about figuring out wedding announcements and Bryan was SO helpful. It is such a easy process, and Bryan works with whatever you give him and he makes it amazing. I can’t stress enough how easy it was and they turned out perfect! Seriously so impressed. 15/10 would recommend! " "Bryan made this process so easy, stress free, and our announcements turned out beautiful! 20/10 would recommend"
"I loved these guys. I am not artistically talented or capable but Bryan made things so easy. He put it together right in front of us with our instruction the whole way. He not only superseded my expectations but improved my ideas in all the right ways. Casual, and comfortable environment as well. Very patient and makes you feel like you can have fun during the process. You can tell he likes his job and definitely knows what he is doing. Prices are also very reasonable and competitive quality. " "We loved our experience w Bryan. He helped us design exactly what we were looking for. He was talented, and even compared prices with us, which was super helpful. Thanks, Anthology!" "Bryan is incredible! We loved how fast everything was and how we were able to construct our wedding invitations and make them exactly how we wanted! Also you can't beat the price of their services! Definitely coming back!" "My appointment with Bryan was fantastic! He was able to take my ideas and make them look better than I had imagined! He paid special detail to little things as well and was great at getting my input!" "Bryan was a miracle worker! We were so picky, but he somehow got everything to be just how we wanted it, but better. I'm pretty sure he can do ANYTHING!" "We got our wedding invitation designed here and absolutely loved our experience. The prices couldn’t be beat- but more than that the designer we worked with-Bryan was exceptional! He was easily able to capture our vision and use our pictures and colors to make our invitations perfect. The process was so easy and we walked away just being extremely happy with the invitations we had. He truly helped our vision come to life and we couldn’t wait to send them all out! Highly recommend this company!" "Bryan knows what he's doing. The whole process was simple, I was able to make adjustments at any stage, my questions were answered very quickly and he had my best interest in mind. He helped me choose the best wording and a custom layout. I would recommend Anthology Print to anyone. My wedding invitations were last minute and I ADORE them. Such a relief and so beautiful, I got tons of compliments from my mother in law. I'm excited to come back for the super cute postcard thank you cards!" "Came in to get wedding invites, and had a great experience. They were very accommodating, and great service. Very professional design cards and service. Would totally recommend!" "It was so much easier using Anthology Print than any other website I tried to use online. It was easy and so much better quality. I LOVED our invitations and since then have gone back to Bryan for help with other graphic design projects. He knows what he's doing and does a great job. It is also great for people who are working with a budget for their wedding. Also, he's a really nice guy too, great customer service."